Photo by Kathy Tran. Right click to download. Dallas-based jazz vocalist, pianist and songwriter Karyna Micaela can tailor her performance to fit the needs of the event or venue, and is available to appear as a soloist, duo, trio or quartet. For booking inquiries, email booking@karynamicaela.com. California native Karyna Micaela spent her high school years absorbing the Great American Songbook; Frank Sinatra and Ella Fitzgerald served as a couple of her greatest mentors. She received her Bachelor of Arts degree in Jazz Studies from San Jose State University. While still in school, she sang "Our Love is Here to Stay" as an opening act for comedian Dana Carvey at the university's homecoming gala. Immediately following graduation, she worked as a professional singer, appearing at famous San Francisco venues such as the Fairmont Hotel and the Top of the Mark. She sometimes sang alongside the renown vocalist Jamie Davis and was invited to sing "Body and Soul" during one of his shows at the San Jose Improv. In 2009, Karyna moved to the college town of Denton, Texas, which is renown for its prestigious jazz program at University of North Texas. It was here that Karyna honed her songwriting and solo performance skills, playing in coffee shops, university events and festivals around town. During this time, she began to take piano lessons from the legendary Julie Bonk. Often times, Karyna would end up singing jazz standards along with Julie's accompaniment, effectively rekindling her spark for the genre. Karyna eventually gravitated towards the city of Dallas and continued to pursue her solo career. It wasn’t long before she dusted off her Real Book and appeared with some of the area’s best jazz musicians at a handful of weddings and private galas. Today, she splits her time between the two ventures, though much of her original music reveals the influence of her jazz background. 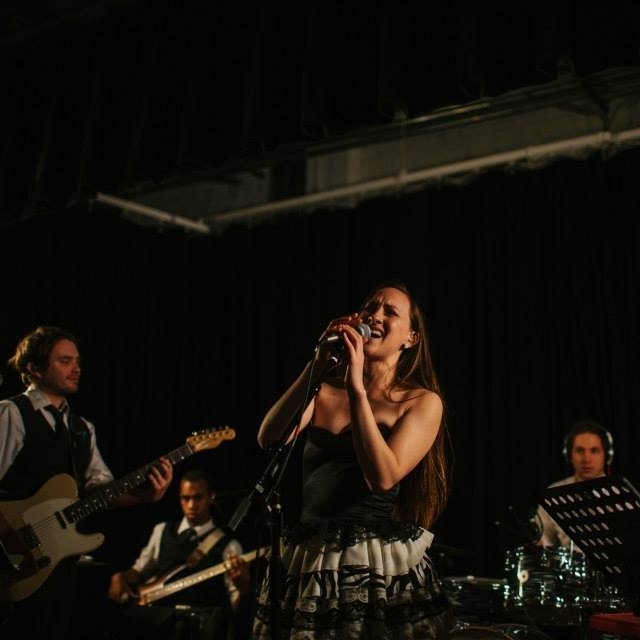 Karyna's repertoire includes classic jazz standards, popular music spanning several eras (fitting within the jazz vibe), as well as her original material. When booking, please specify your preference, if any. Welcome! Thanks for joining the family.